Higher Ground has created several tile mosaics throughout Harlan County, Kentucky. Like the photography and theater projects, the tile mosaics rely on oral histories to tell a story about that particular location. The mural features a grandmother telling her grandson stories sitting on a front porch in front of a sweeping mountain view. The grandmother's stories, which are taken directly from local oral histories, are spelled out in clay in the mountains. This art piece derived from a story told by Dora Bell Keleman who was Hungarian. Keleman told the story of how her mother-in-law spoke many different languages and would help the different immigrants write letters home. When they received paychecks they would bring her a pair of overalls and she would roll the money in the cuffs of the overalls and mail them to families back home. This mosaic stands as a tribute to those who left families behind in Eastern Europe and started a new life in the coalfields of Appalachia. ​The Clover Fork Clinic mosaic was a collaboration between the clinic, Evarts High School and the Appalachian Program at SKCTC. The mosaic depicts various aspects of life in Clover Fork or Evarts. "Welcome to Cloverfork" is spelled in tile across a scene of mountains and cloudy skies. Within the letters of "Cloverfork" artists included images of faces, railroads and other images from Evarts' history. The Pine Mountain tile mosaic is a tiled hopscotch board featuring local flora and fauna. 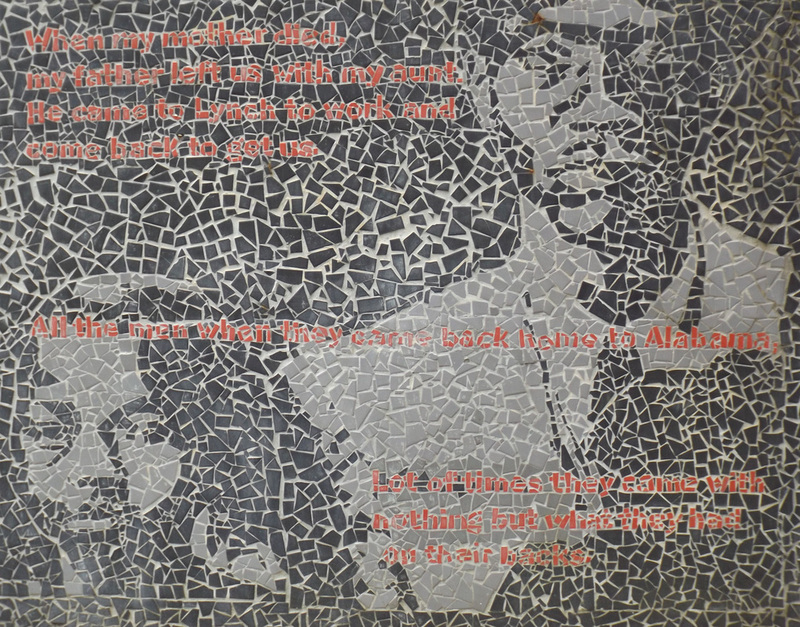 This mosaic incorporates the history of Pine Mountain Settlement School as a boarding school and its current mission of ecological education. The Lynch mosaic includes several suitcases and trunks to symbolize the families that came to Lynch from Europe and the rural South. The Benham mosaic celebrates the mountaineers who lived in this region before the coal industry. Photographs of mountaineers are represented in tile along with images of gardening and canning around the circular base modeled after a canning jar. This mosaic is a tribute to a way of life, to living off the land.